totalprogUS: Netbeans : Create your own shortcut. Netbeans : Create your own shortcut. 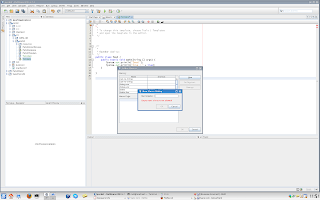 You know eclipse shortcut but it doesn't exist in Netbeans. Note : the complete shortcut list is available in menu Help -> Keyboard Shortcuts Card. Solution : Create you own shortcut with netbeans macro. Like excel, you can edit and save you macro. Image that you want delete a line with CTRL + D.
2) Select one line by clicking severeal time on the line then delete it. 3) Stop recording by cliking on Edit -> Stop recording. 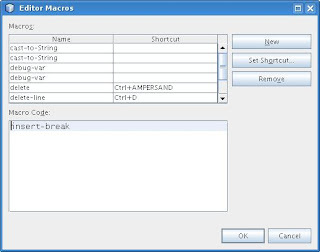 Enter the name of the macro (ex:delete-line) then click OK. The last thing you have to do is "Set shortcut" and define your shortcut. How to find mvn site command in Netbeans 6.7 ?